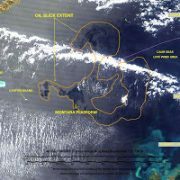 New images from NASA’s Terra and Aqua satellites keep coming in for the ongoing oil spill in the Timor Sea. 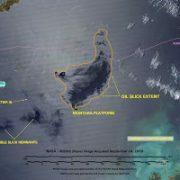 At 8:45 am local time, the Terra satellite passed overhead and captured this image, showing oil slicks and sheen throughout a 9,870 square mile area (=7,455 square nautical miles). Part of the slick appears to be in contact with Cartier Island, a national marine reserve. NASA / MODIS (Aqua) satellite image, September 24, 2009, with SkyTruth analysis. Five hours later the Aqua satellite took this image. The wind speed had increased from 10 knots to 18 knots, creating a much rougher sea surface and breaking up or obscuring the thinner slicks and sheen. Only thicker portions of the slick are apparent in this image, adjacent to the Montara oil platform, covering about 3,940 square miles (=2,976 nautical square miles). No slicks are apparent near Cartier – a good sign on Day 34 of this continuing spill. A team of marine researchers lead by World Wildlife Fund has set out to study the effects of this spill on ecosystems and wildlife. They should be in the area for the next couple of days. If we’re lucky, we’ll get satellite images that correspond with their “sea-truth” observations and photos. See all our satellite and aerial images of the spill here. The spill from the Montara platform blowout continues unabated since August 21, now in its 33rd day. Using the oil company’s unsubstantiated estimate of 400 barrels (=16,800 gallons) per day, that means at least half a million gallons have been spilled, Australia’s worst offshore oil production spill since drilling began there 40 years ago. Critics calculate the spill rate could be much higher – closer to 3,000 barrels per day – based on the flow rates of nearby oil production wells. If that’s accurate then over 4 million gallons have been spilled so far, with at least three more weeks to go before the runaway well can be controlled. 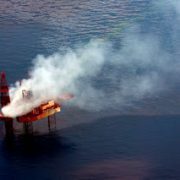 By either measure, this ranks as one of the worst offshore oil spills ever, and it happened at a new, state-of-the-art platform. If you get your world news here in the United States from major TV networks or newspapers, you’d never know this was happening. This incident hasn’t been mentioned by the Washington Post, despite the fact that politicians on Capitol Hill are calling for oil drilling off the beaches of Florida, the Carolinas, and Virginia, and in the salmon-rich waters of Bristol Bay in Alaska. Kevin Hassett with Bloomberg News explores the political significance of this spill and it’s relevance to the drilling debate here in the US. Some of the Florida media are making the same connection, with TV news pieces, articles and editorials that pose the question: what if it happened here? Folks in Alaska are also starting to take notice. MODIS Terra and Aqua images from September 17 have a nearly ideal sunglint pattern to reveal the oil slicks and sheen resulting from the ongoing blowout and spill from the Montara platform in the Timor Sea off Western Australia. The well has been uncontrolled now for 4 weeks. 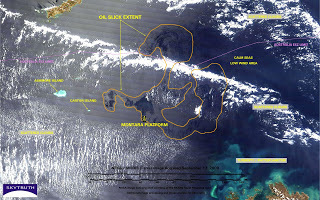 NASA / MODIS satellite image, September 17, 2009, with SkyTruth analysis. Patchy, discontinuous slicks and sheen, separated by patches of open water, occur across an area of 7,530 square miles (=5,680 square nautical miles). To the east, the slicks merge with areas of low wind and the edge of the sunglint region. To the west, slicks in the immediate vicinity of the platform itself are very plainly visible, and have approached within 14.5 miles (=12.5 nautical miles) of the Cartier Island Marine Reserve. Hopefully the wind, current, and ongoing response efforts will keep the oil away from that biologically rich area. See all the latest satellite and aerial pics in our gallery. Subscribe to this blog feed to get automatic updates in your email whenever we add anything new. SkyTruth just got new aerial photos of the Montara platform, taken on an overflight by Environs Kimberley on September 12. 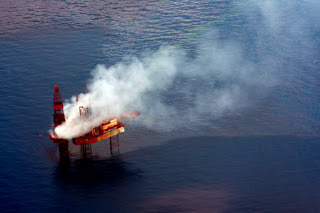 The platform is still spewing crude oil into the Timor Sea and a potentially explosive fog of natural gas and gas condensate into the air. The West Triton rig is visible in one of the pics; it’s begun to drill a relief well that will attempt to intercept the damaged well 8,500 feet below the seafloor, a process that will take 3-4 weeks at best. Montara platform and West Atlas drill rig, September 12, 2009. Photo courtesy of Environs Kimberley. Also visible: extensive oil slicks and sheen still covering the sea in the vicinity of the platform, in calm seas. This spill has been uncontrolled now for almost a full month. Click here to go to our growing gallery of aerial photos, maps and satellite images. 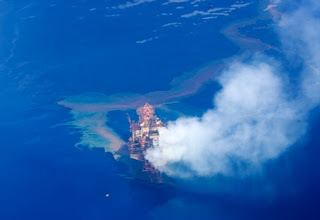 Timor Sea Drilling Spill – Another Exxon Valdez? 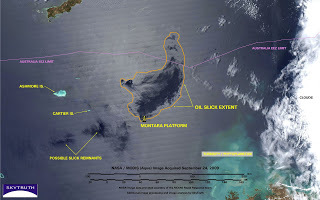 Folks are asking us “How much oil is being spilled into the Timor Sea?” We can’t answer that with the MODIS satellite images we’ve been getting from NASA; they just don’t contain enough information to estimate how thick the oil slicks are, so we can’t come up with a quantity. All we can do is measure how extensive the slicks are, and where they are. …based on information available on average flowrates for similar wells in the region and the company’s own data we estimate conservatively that at least 3000 barrels of oil per day are being released from the well. Back in 2002, the Montara-3 appraisal well flowed at a rate of 5,000 barrels of oil per day. And other offshore wells in the same basin have tested at nearly 8,000 barrels per day. So this estimate seems defensible. At 42 gallons per barrel, that’s 126,000 gallons of oil per day. The U.S. Coast Guard defines anything over 100,000 gallons as a “major” spill. The well blew out on August 21, so as of today (9/11) it’s been spilling oil for 21 days (click here for a web-counter tracking this spill). That would mean 2,646,000 gallons have been spilled so far. The West Triton drill rig is now on the scene after a long trip from Singapore, and is preparing to drill a relief well that will intercept the damaged well so they can fill it with mud to staunch the flow. If all goes well, it will take at least 4 weeks to complete the relief well. That means an additional 3,528,000 gallons will be spilled, for a grand total of 6,174,000 gallons. Six million gallons is more than halfway to an Exxon Valdez-sized spill. /wp-content/uploads/2016/08/test_logo.png 0 0 John Amos /wp-content/uploads/2016/08/test_logo.png John Amos2009-09-11 20:01:002016-08-24 19:26:21Timor Sea Drilling Spill - Another Exxon Valdez?